FUNDOG NEWSLETTER - To get email updates through our newsletter Join FUNDOG. Diamond Heights Blvd. at Addision St.
Sen. Wiener and Sup. Sheehy will be in attendance, as we honor them for their support for the improvements at Walter Haas DPA. On Wednesday, June 20 from 7 to 8:30 p.m. in the auditorium, the focus will be on food, friends and fun. Come out and rejoice for summer with a dessert and appetizer potluck. Bring something to share. Beverages and table settings provided. Celebrate our recent accomplishments and offer your wish list for the coming year. Preview a special presentation of the touching new documentary Joby’s Run – A migrant from Australia and his trusty bulldog feel isolated in their new home city of San Francisco until finding an unlikely solace in the form of a small urban dog park. 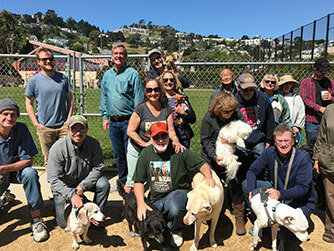 On May 4, SF Rec & Park (SFRP) installed a new decomposed granite surface and upgraded the irrigation system in Joby’s Run dog park.On May 12, Friends of Upper Noe Dog Owners Group (FUNDOG) celebrated the improvement and congratulated each other on the success of their persistent lobbying for this work. 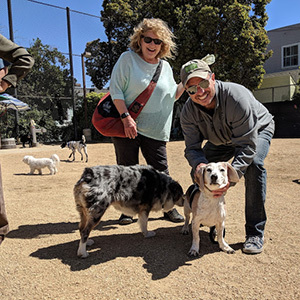 SFRP General Manager Phil Ginsburg came with his 13-year-old basset-beagle mix Barney and Rec & Park Area 5 Manager Carol Sionkowski brought her little chiweenie Nugget. District 8 Supervisor Jeff Sheehy joined the party, too. These three were present to witness the greatest benefits of their jobs, seeing the satisfied, happy faces of the neighbors they help. 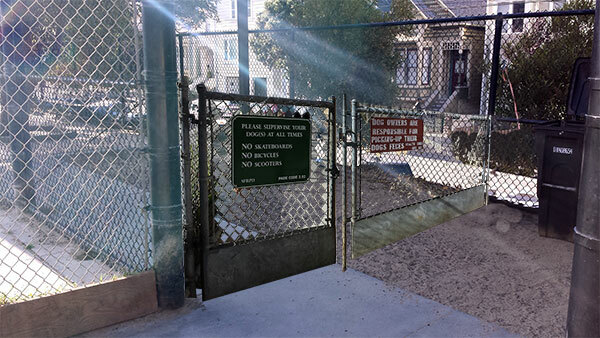 After learning about the decaying condition of the dog run, Jeff and Phil responded quickly to address the community's concerns and support the project. Carol, who was already engaged in a solution, actually got out a shovel and put her back into the process. She and her amazing gardening crew spent long hours expertly grading and installing the surface. Ginsburg thanked dog owners who have made a community here, praising responsible use of official off-leash areas. He called Upper Noe a great use of shared space for everyone. "There is probably no more collaborative, collegial, happy community around any single facility in our park system than this one. If you can't come here and smile and see our dog owners and kids playing ball and people using the courts and the Rec Center then you shouldn’t be living in the city because this is as beautiful and joyous and happy as it gets." As dog owners retired to shady seats under colorful umbrellas and dogs enjoyed a table full of tasty treats –thanks VIP Scrub Club– Ginsburg reviewed our wish list of repairs, including the blacktop basketball court and the tennis court. FNVRC has just learned that both of these items are included in the mayor’s 2019/2020 budget and put on high priority. With these upgrades, the park will be back in tip-top shape. This is exceptional news. FUNDOG has worked for years on issues with the rapidly diminishing cover of decomposed granite (DG) and has regularly requested loads of fresh material. Sionkowski has only been on the job for a year or so. The history of our concerns is new to her. The work will start with fixing the irrigation system that keeps the dust and smell under control. We are hoping to address some drainage issues, too before the loads of DG arrive. Joby's Run (Upper Noe Dog Play Area) has not received significant surface maintenance in the ten years since the last renovation. It is now looking muddy because we are running out of gravel. The finer material that should be under a layer of stones is exposed. When it dries, it will blow away and we will be looking at bare clay. This is already happening in spots. Puddles that should be invisible under the gravel are now lingering because there is no more excess gravel to move around to the low spots. Rec & Park needs to act now to restore the surface. It affects the hygiene, smell, usability, play-ability and overall attractiveness of this highly used facility. Call 311 today and tell them that Upper Noe Dog Play Area needs gravel. If they say it has been reported already, request that your name be added to the list. Calling 311 is the best way to create a record of your request. It is far better than a petition. Every city department, agency and politician sees 311 records. 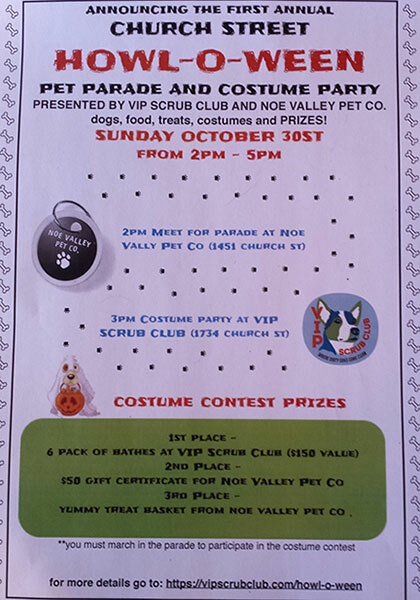 Sunday, October 30, 2 - 5 p.m.
Starts at Noe Valley Pet Co. at 2 p.m.
parade down Church St. to 30th St.
go through the park and then down Day St.
to VIP Scrub Club for a Costume Party !!! Free treats and fun. Prizes for best costume. Celebrate the end of this election cycle at our last meeting of 2016! Who: Neighbors of all sorts, dogs too. Get to know your neighbors and your community association. Welcome the VIP Scrub Club. Experience the debut of the Upper Noe Neighbors Wine Club. Join us for a taste of this new bi-monthly wine club, where you can circle the globe without leaving your neighborhood. Hosted by Plumpjack Wines. After so much planning and discussion, a new set of gates went up in Joby's Run last week. 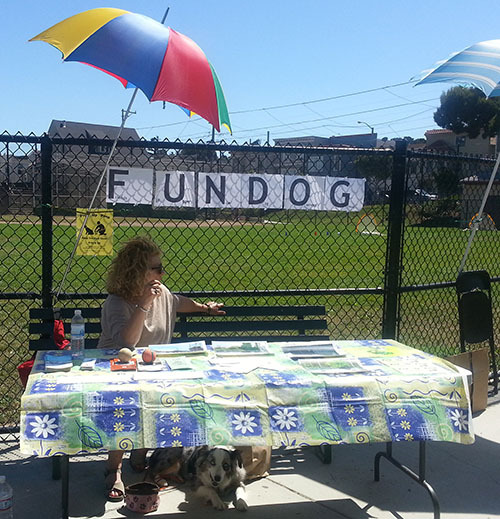 FUNDOG members launched a fundraising drive, including a bakesale on a frigid summer afternoon, that netted more than enough to cover the expense of the gate. A big shout out to SC Barns of Santa Rosa all of their help designing and installing this versitile and attractive addition to our park. On the positive side, the long struggle to brighten up Joby's Run with more trees has finally borne fruit. With the arrival of the much-needed rains, Rec & Park gardeners felt confident enough to begin planting. The species is Tristaniopsis laurina (Elegant Brisbane Box). The first three went into the southeast corner. The other two will stand near the north end grouped with the original. With a bit of TLC, they should soon provide shade for the dogs and a greener environment for visitors. The petition to urge lawmakers to ban dangerous pesticide use at schools and public parks has accumulated 11,275 supporters. If you have not yet done so, Please take a moment and add your support by going to the link below. Together, we can effect positive changes for our local environment. Please take a moment and add your support by going to the link below. You may be aware of recent media attention to the use of the herbicide Roundup in local parks. The main ingredient in Roundup, glyphosate, was recently listed by the California EPA as a chemical "known to cause cancer." Roundup is highly suspected in a recent spate of cancer cases in dogs. Our hearts go out to the victims and their families, especially our neighbor Victoria who raised the alarm for action after the premature death of her dog Barack. Rec & Park’s Natural Areas Program (NAP) uses roundup frequently in Glen Canyon. They applied herbicide there 37 times in the past two years. About half of the applications used glyphosate. The city of San Francisco Deptartment of Environment has reclassified glyphosate as a Tier I pesticide -- the most toxic rating. And yet the spraying continues. 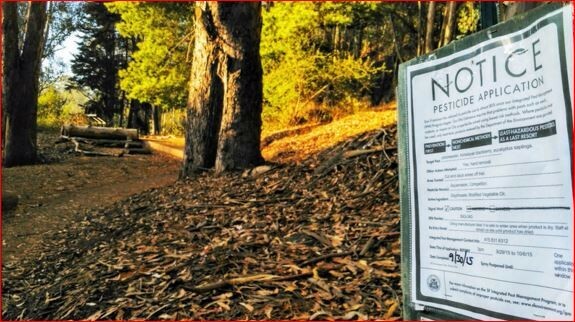 A local group monitors use of herbicides in parks and provides information on its website: http://sfforest.org/2015/07/05/roundup-reclassified-as-tier-i-sf-dept-of-environment/ . Gardeners at Upper Noe Rec Center reported that Roundup is not used there ever. Five new trees will be planted in Joby's Run beginning next week. The five Tristania were purchased a couple months ago. Our gardeners have been waiting for the autumn rains to arrive so that the young trees have the best chance for survival. Three will go in the southeast corner to make that area more inviting, increase shade and add a visual buffer between the dog run and neighboring properties. The other two will be situated near the existing Tristania. The placement criteria focused heavily on maintaining clear lines for ball throwing and ensuring that the park remains well-lit. While Rec & Park has agreed to allow installation of a set of gates between the main part of Joby's Run and the Day Street extension, they require a licensed contractor to draw up detailed plans and install the gate. Details for this project are at http://fundogsf.org/news.html. Anyone wishing to form a committee to move this project forward is encouraged to contact info@fundogsf.org. Recently, I submitted the following proposal to Rec & Park. It derives from much discussion and debate, years of experience and an eye toward the future. This project does not diminish any of the other on-going needs that we have. Rec & Park has acknowledged this proposal and has initiated discussions to determine cost and procurement. Send comments to me chrisf@fundogsf.org. A PROPOSAL FOR A NEW GATE in Joby's Run. 1. Contain dogs entering from the west entrance, particularly packs, from charging unattended into the main area of the DPA. 2. Allow guardians who are sitting under the trees in the Day Street extension to keep their dogs in sight and under their command. 3. Allow guardians sitting in the main area to keep their dogs in sight and under their command. 4. Allow for separate areas so that games of fetch or training can proceed away from the general play area. 5. Allow for a quieter respite from the often-crowded main area. 6. Allow guardians to separate hostile dogs from one other. The type of gate that users feel is most appropriate is an exact copy of the inner gate at the 30th Street entrance to the DPA, a bit of stock fencing that combines a wide gate with a narrower gate. Both can be swung aside together to provide complete access if needed, or the wide gate can be pinned in place to act as a fence leaving just the narrower gate for pedestrian and dog access. 1. Free access to the trash can and tools from the larger main body of the DPA. 3. Plenty of room to swing both gates completely open and out of the way along the northern fence should full access be necessary for maintenance. Below is a schematic of the DPA showing the proposed location. Also, included is a photo mock-up of the desired results created by imposing the existing 30th Street gate onto the proposed location. Happy New Year. 2014 was very good for us and we are hoping to build on that in 2015. Over the past year the appearance and functionality of the entire park has improved remarkably. The gardens, play areas, walkways and facilities are cleaner and neater than ever, and response to repair issues has been speedy. Thanks go out to park management and to our new gardening and maintenance crews for their efforts, especially for their ability to spot issues and for taking the initiative to address them promptly. Long term issues such as the malfunctioning sprinklers in Joby's Run and the care of the adjacent gardens are finally getting the attention they deserve. Inside Joby's Run, the experience continues to improve. Nancy has been the driving force behind all the enhancements (windscreen, umbrellas, etc.) and deserves a big hand. She has made it a mission to protect us from the wind, sun and rain as we congregate with our dogs. And she's managed to do that in a way that is attractive and easy to maintain. Good job! In addition, a big hand goes out to those who pick up a broom, rake or shovel now and then to keep the Joby's Run pleasant. In particular, Edsel deserves our thanks for making a bit of sweeping a regular practice on his daily visits. Regular maintenance of Joby's Run is entirely up to us. Park staff will never take on this task. So please lend a hand when you can. Some things in process for Joby's Run in 2015 are new benches, more trees, and a gate separating the main play area from Lilly Lane. In addition, we are still working on improvements to the sprinkler system and the gate latches. Be the eyes and ears for the park. Staff does not experience the park the way we do. Please note and report any issues. If you see something and it bothers you, report it to park staff in the office, send an email to info@fundogsf.org, or call 311. 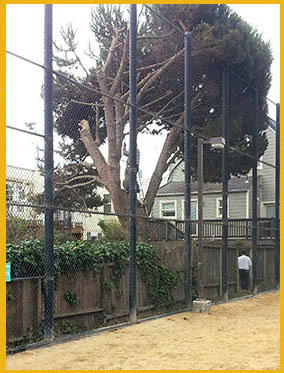 Upper Noe Rec Center office: 415 970-8061 Park Patrol Rangers: 415 242-6390 SF Police non-emergency: 415 553-0123 Animal Care and Control: general info 415 554-6364, report dog bite 415 554-9422 The current FUNDOG treasury is $374. To donate, see http://fundogsf.org/donate.html . Donations take care of ongoing needs (benches, brooms, rakes, shovels, website), and special projects such as new benches when we find suitable ones. UD dog park is closed through Spring 2014. To find out more, please attend a meeting hosted by Friends of Upper Douglass Dog Park and Supervisor Scott Wiener. If this park is important to you, please make sure your voice is heard. Agenda: Discussion of timelines for completion and to introduce new park operational policies when the park reopens to promote longp-term sustainability and address neighborhood concerns. It's been a good year. We're in better shape in Joby's Run than we were a year ago and that's something we will build upon in 2014. We see more people showing concern for our park and pitching in to do the small chores necessary to make it a pleasant place to be. Keep it up and spread the word to others about FUNDOG. As a group we have been stonger than any individual efforts could possibly be. The National Park Service (NPS) intends to severely curtail on-leash and off-leash recreation on our local beaches, almost all of which are within the Golden Gate national Recreation Area. They will ban dogs completely from some areas that see little other activity. 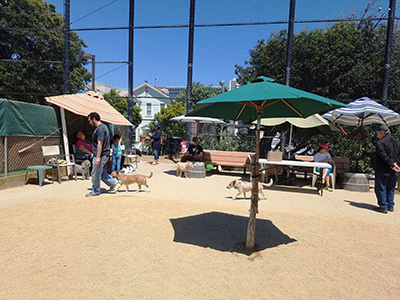 As alternate off-leash places like McLaren and Bernal become overcrowded, the overflow will be pushed into smaller and smaller local parks, like Upper Noe. This effect was apparent during the closure of Fort Funston and other beaches during the recent federal shutdown. Please take action for yourself, your family and neighbors by submitting a public comment to the NPS. When you see dangerous situations, please be responsible and say something before injury occurs. It is okay to alert someone, in a non-confrontational way, about their behavior. A dog park is a unique environment and some people might not be aware that they are creating hazards for others, their children, pets, or even themselves. Common errors include: placing small children on the ground; letting children wander unattended; using small balls around big dogs (choking hazard); being careless with food; disregarding aggressive behavior; ignoring dog(s) completely while fixated on a cell phone (Hey, wake up!). Signs only do so much and mostly they get ignored. So, speak up! And of course, remember to react kindly whenever someone alerts you to a missed pile of poop or to something you or your dog is doing (or not doing) that is causing concern. When people have concerns, they often don't report them because they are not sure who to contact. Please know that you can always send an email to info@fundogsf.org and we will follow up with the proper authorities and lobby for a solution. In addition, please address authorities directly. The combined effort will have more impact. Concerns about safety, park maintenance or issues with the behavior of visitors should first be directed to the rec center office. Any injury should be reported there as well so that an incident report can be filed. In addition, report maintenance problems to 311 (SF Customer Service Center) so that they will be tracked and get timely attention. After park office hours, safety concerns or behavior problems, include building security, partying or rowdiness, should be directed to Park Patrol or to SF Police depending on how serious the issue is. The police usually respond quicker but Park Patrol has access keys. Of course, any criminal activity requires a call to 911. In the case of aggressive dogs, dog bites, or other dog-related concerns, call Animal Care and Control. If you believe a dog to be dangerous, the SF Police Dept Vicious and Dangerous Dog Unit can be alerted. Filing a complaint with them is a pretty extreme measure and should be a last resort. Thanks to Upper Noe Facilities Coordinator Cheryl Woltjen and our new Rec & Park Area Manager Steve Cismowski for their persistence and insistence on repairs until they were resolved. Plumbers have finally replaced or adjusted sprinkler heads that are necessary to abate odor and dust. The place is now evenly and adequately wetted nightly. It looks like they just repaired the drinking fountain, too. At the western entrance, the gate that was in danger of falling off of its mount has been securely welded and the concrete that was failing around the wobbly fence posts has been replaced. Also, the plantings around the 30th St entrance have been trimmed and mulched for a much more pleasant appearance. Plans are still underway to add 5 more trees to Joby's Run and to clean up the area beyond the fence on the east side. Benches - The most dangerous bench has been given a temporary fix, thanks to Nancy. We are still looking to buy replacements with financial asssistance from Friends of the Noe Valley Recreation Center if lobbying efforts to get Rec & Park to provide them are unsuccessful. If you know of a source for high quality benches that would be safe for dogs, please email info@fundogsf.org . Funds - The current FUNDOG treasury is $347. To donate, see http://fundogsf.org/donate.html . 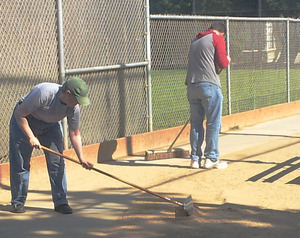 Donations take care of ongoing needs (benches, brooms, rakes, shovels, website), and special projects such as the windscreen, and helps us to be prepared for maintenance and improvement. 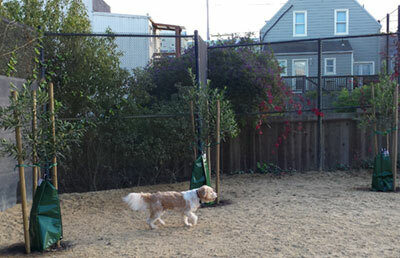 Subscribe to the Noe Valley Rec Center Newsletter featuring Canine Corner to keep up with the latest at the rec center. K9 Scrub Club is hosting a Howl-O-Ween Party on Thursday, October 24 from 5 - 8 PM. Drop by for some Dress up your pup and drop by for some spooky fun. 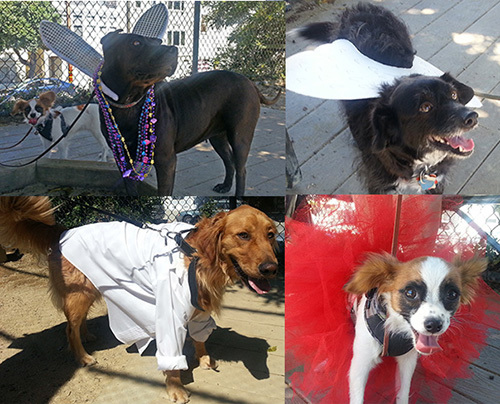 FUNDOG hosted a Costume Contest as part of Cinco de Noe on Saturday, September 7. It was the hotest day of the year but still was a lot of fun. Barb and Annie take shelter from the blazing sun and heat. clockwise from upper left: Sheba, Grover, Coco, Riley. Be assured, our volunteer efforts are being recognized. Rec & Park General Manager Phil Ginsburg had plenty of praise for us when he spoke at Upper Noe on September 7. Since then, I met with our new Rec & Park Area Manager Steve Cismowski on October 9 in Joby's Run. This highly productive meeting has help to clarify some of our needs, illuminated Rec & Park abilities and forged a stronger spirit of cooperation. Stay tuned for results. Benches - Please exercise caution until we can do something to improve safety! This comes in the wake of a sad accident. 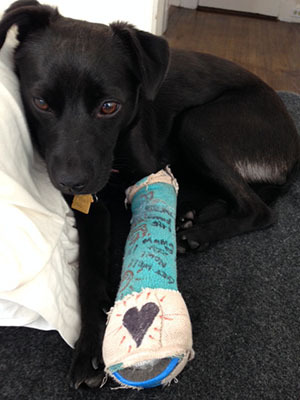 Little Lola broke her leg when it became trapped in the slats of one of the moveable benches. We all hope that she is up and running around soon. Meanwhile, the benches have been inspected to see what we can do to make them safer. 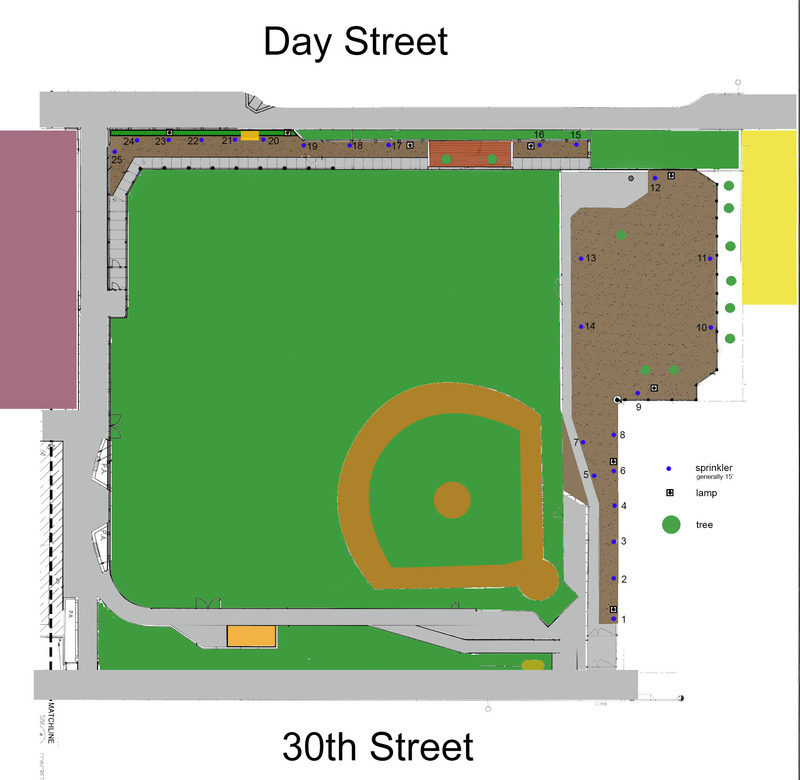 Also, Friends of the Noe Valley Recreation Center has voted to help us buy benches. We are also asking Rec & Park for some help. Tree replacement - We are now looking at adding 5 new trees to create 2 distinct groups of 3 trees at either end of the main area. The new ones will most likely be Tristania Laurina to match the one at the north end. Gravel - Please rake the gravel back from the drains daily. There is concern that the drains will clog and cause us odor and drainage problems. Gate - The inner gate at the west end has been reported as a safety issue and will be fixed as soon as Rec & Park can find a solution. The post is loose in the concrete and might require a major repair. For now, just be sure to close it as much as possible. Funds - Our current treasury is $342. We got a boost from the Cinco de Noe raffle. Thanks to everyone who pitched in. To donate, see http://fundogsf.org/donate.html . Donation take care of ongoing needs (benches, brooms, rakes, shovels, website), projects such as the windscreen and helps us to be prepared for maintenance and improvement. We have some great local happenings coming up. Join in! We're getting ready for Cinco de Noe (Sept. 7). FUNDOG and the LadyBug gardeners will be joining Rec & Park in a labor of love, trimming, weeding, clearing debris and putting a shine on our lovely park. Even if you can only spare an hour, show up any time and pitch in. Bring gloves and your sparkling personality. Tree replacement - Rec & Park says more trees are coming to Joby's Run this fall. Gravel- Please discourage dogs from digging. The gravel is getting pretty thin. The clay underneath is inappropriate for the surface; it's messy and unsanitary. Benches - We put in another park benches and are looking for more. If you have any leads on some sturdy ones, new or used, that are appropriate, share that info, please. We can repaint them, if necessary. Funds - Our current treasury is $200.00. Thanks to everyone who pitched in. To donate, see http://fundogsf.org/donate.html . Donation take care of ongoing needs (benches, brooms, rakes, shovels, website), projects such as the windscreen and helps us to be prepared for maintenance and improvement. Here's the recent news. Your input is important. Please send your comments and suggestions. Meatballs laced with strychnine have been found in areas of Twin Peaks, Diamond Heights, Cole Valley, and Lower Haight, and there have been some reports saying they have been found in Bernal Heights and Glen Park, too.. Police say they're still looking for those responsible for leaving some 50 poisoned meatballs on a Twin Peaks street. Please be alert and spread the word about this. Anyone with information is asked to contact police or the anonymous tip line at 415-575-4444 or text a tip to TIP411 with SFPD in the beginning of the message. If you find one of the poisoned meatballs, officials urge you to use gloves to handle them and call police. 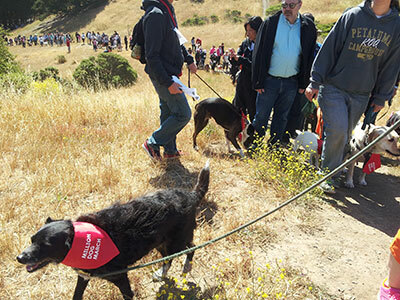 Okay, it wasn't a million but there were 1000 very well-behaved dogs on June 2 at McLaren Park. It seemed to go flawlessly; I didn't observe a single scuffle. The event was very well-organized and nearby parking was pretty easy. Supervisor Scott Wiener was there to start the dogs on their way. The event benefited Animal Care and Control and all of the pooches and owners who got a beautiful day, great views, healthy exercise, live music and treats, lots of treats. It didn't take but a dozen or so happy volunteers enjoying a sunny June morning to whip Joby's Run into shape. Some things just have to be done from time to time, like scrubbing down the water fountain, clearing grass and weeds, and raking the gravel back from the edges. Of course, the whole place got a thorough sweeping, too. Thanks to everyone who pitched in. The broad, majestic Italian Stone Pine on the property neighboring Joby’s Run was cut down last week. Part had fallen and the rest was in danger of falling. Another source of shade bites the dust. Surface - The gravel surface is wearing thin again. That huge wind-storm earlier this month took a lot of the gravel away. Please refrain from digging at the clay that is showing through. Tree replacement - Rec & Park will hopefully get to that soon. We'll keep reminding them that they promised replacements. Sprinklers - Still lobbying to get these fixed. 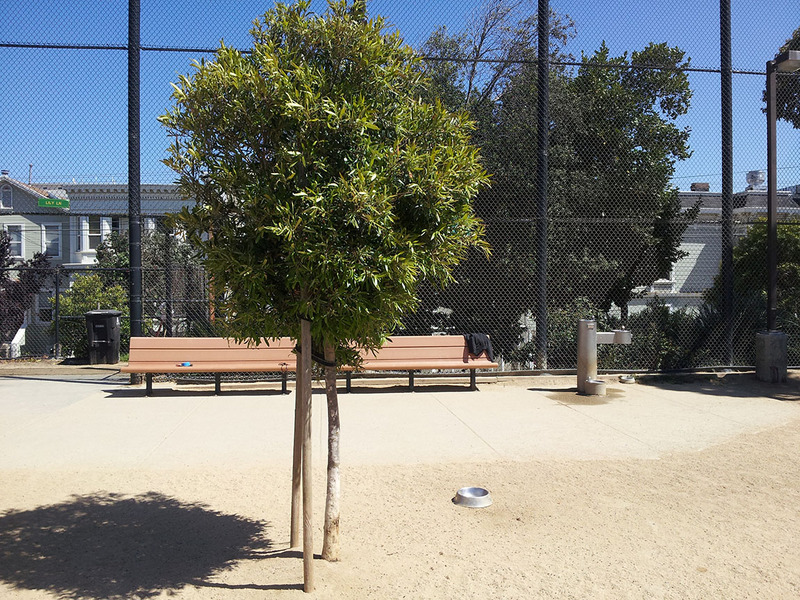 Benches - Friends of the Noe Valley Recreation Center has offered to help us get a couple benches if Rec & Park cannot provide them. It is best if we let the park install them but we'll get some soon one way or another. Funds - Our current treasury is $216. Thanks to everyone who pitched in. To donate, see http://fundogsf.org/donate.html . Donation take care of ongoing needs (brooms, rakes, shovels, website), projects such as the windscreen and helps us to be prepared for maintenance and improvement. Stand up for our dog community and try to set a world record. This is going to be FUN! Register now. See http://www.sfdog.org/mdm for details. There is a registration fee but profits go to SF Animal Care and Control so consider it a donation to a great cause. trimming and weeding the garden on Day St behind the benches. The Ladybug Gardeners will also be working on these green spaces throughout the park. Please consider lending a hand, if only for an hour. It's a great way to get to know your neighbors! Rec & Park is ignoring maintenance on the irrigation system that they installed to abate dust and odor in Joby's Run. We have cleaned the sprinkler heads, created a schematic of the system and inventoried each head, even posted video of the problem on YouTube! We need to bark louder! Please call 311 and report the sprinkler system as broken. Say, "Many of the sprinklers don't spray and those that do create only muddy patches while leaving vast areas dry and dusty." You might mention the health hazard to park users and neighbors. If they tell you that it has already been reported, tell them you want to add your complaint to the case. Tree replacement - Rec & Park removed our last pine tree. They say spider mites were killing it. They have promised us replacements but not pines. The tree nearest the water fountain has done well and doesn't drop leaves, fruit or other debris so we're asking for a couple more of them. Windbreak - A total of 24 feet of wind protection is being installed. This clear barrier will be very attractive in the summer months when fog joins our evening breeze. Clear material is very important to maintain visibility throughout the park. I think someone once said, "The coldest winter I ever spent was in a dog park in summer in San Francisco." Gravel - Scoop the poop, leave the gravel. It is expensive and hard to get. Please remind those who prefer to use a shovel that they should conserve gravel. 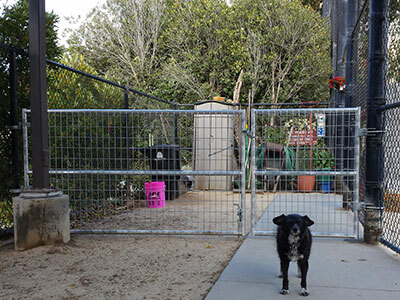 Gate - After studying the feasible options and getting much feedback from our membership, a gate between Joby's Run and Lily Lane is no longer being considered. The cost would be ridiculous and the space is too small; a proper installation requires double gates to provide adequate separation. Funds - Our current treasury is $103.60. Thanks to everyone who pitched in. To donate, see http://fundogsf.org/donate.html . Donation take care of ongoing needs (brooms, rakes, shovels, website), projects such as the windscreen and helps us to be prepared for maintenance and improvement. Canine Corner - Subscribe to the Noe Valley Rec Center Newsletter featuring Canine Corner to keep up with the latest at the rec center. Funds - current treasury, Fun(d)raiser opportunity. Joby's Run is officially a Dog Play Area. It can accommodate many good dogs and lots of people as long as we play nice. The rules can be hard to find so they have been compiled and posted to the FUNDOG website. Effective stewardship is vital to the well-being of the park and our neighborhood. FNVRC continues to work for Upper Noe through volunteerism, organization and gifting. Consider the clean and well-maintained facilities and landscape, the native plant additions, events, tot concerts, furniture, toys, and equipment that are provided for all. You can help and add your voice to the decisions that affect our beautiful park. It is important for dog owners to be involved to ensure that our needs are being heard and met. FNVRC's goal is to meet every 2 months. On Wednesday, April 24 at 7 PM, come to the auditorium at Upper Noe Rec Center to join or just to find out more. Stand up for our dog community and try to set a world record. Register now. See http://www.sfdog.org/mdm for details. Sprinklers - Rec & Park manager Kristin Bowman inspected the SPRINKLERS on Thursday and came up short on her evaluation. "We cleaned some heads and I put in a TMA (work order) for the head along the back fence that does not pop up. Overall the system looks a lot better than last year." In fact, the system works absolutely no better than last year. FUNDOG has cleaned and inventoried all 25 sprinkler heads, created a schematic and shot video of malfunctioning sprinklers but that doesn't seem to be enough evidence. We'll keep pushing on this. Benches - Facilities manager Cheryl Woltjen has looked all over Rec & Park for some surplus BENCHES for us to use but says none are to be found. I am writing a request for some into a grant proposal being submitted to the SF parks Alliance. Nice, durable ones like we have by the water fountain are about $900 apiece. Fingers crossed. Windbreak - Summer winds are the worst! It appears that an affordable solution is at hand, slat inserts (see picture). We'll give it a try. Gate - Study continues on whether to install a GATE between Joby's Run and Lily Lane; costs look to be considerable and appropriateness is being contested. Funds - Our current treasury is $71.72. Thanks to everyone who pitched in. We are not an official non-profit and the FUNDOG business account was closed because it cost more in fees than we take in. So, no checks, no tax write-off. We deal in cash. Please pony up to take care of ongoing needs (brooms, rakes, shovels, website) and to be prepared for improvement projects. Fundraiser - K9 Scrub Club has offered to throw us a Fun(d)raiser. It looks like that will be happening in June or July. if you want to work on that, please respond or talk to me. Bow Wow Baking class at the rec center CANCELLED for summer. It will be offered again in the fall. Subscribe to the Noe Valley Rec Center Newsletter to keep up with the latest at the Rec Center. Lots of exciting things are happening for dogs and their owners. Learn from Chef John Rutherford how to bake your own delicious and healthy canine treats along with discussing nutrition and supplements for your happy and healthy pooch! 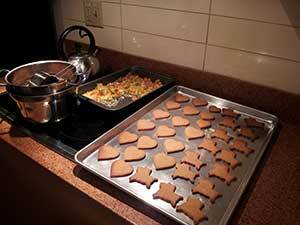 Dogs cannot come to class but they will enjoy the yummy treats and meals you will be taking home for them each week. 6th annual DogFest , Duboce Park , Sunday April 13 , 11-4pm. All are welcome! For more details, visit http://mckinleyschool.org/dogfest. The more the merrier! Enter your dog in our Everyday Dog Show! 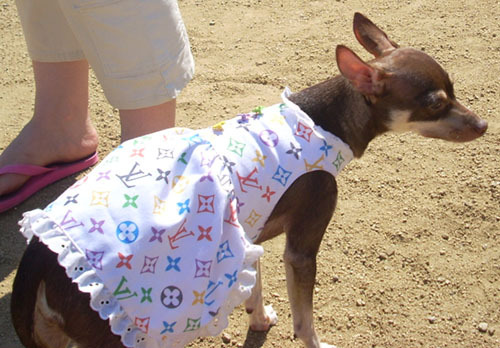 Peruse our doggie vendors or find true love in the Rescue Zone! Jumpy houses, face painting, carnival games, delicious food, and more! emcee Daniel Handler, official representative of Lemony Snicket! Make a bid on an auction prize! Baseball season is back - So is the hazard of being hit by a foul ball or errant throw. If you or your dog are hit, please file a report at the Upper Noe Rec Center office. If you witness or know of any incidences, please encourage the injured party to file a report. A paper trail is necessary to get any action from Rec and Park to improve the fencing or to monitor use - the field is designated for small children only. Maintenance items - The SPRINKLERS are back on but still need repair; they are vital to keep down the dust and smell; Rec and Park is aware of this and have been gently prodded to hurry up. 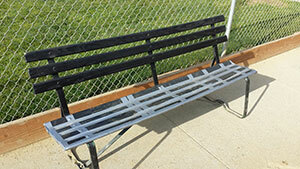 A couple extra BENCHES have been requested and should show up soon; Rec and Park will provide them at no cost. A WINDBREAK for the north end by the fixed benches is being studied; cost should be less than $45; summer winds are the worst! Study continues on whether to install a GATE between Joby's Run and Lily Lane; costs look to be considerable. Funds- Our current treasury is less than $40. it would be prudent to increase this to take care of ongoing needs (brooms, rakes, shovels, website) and to be prepared for improvement projects (see Maintenance above). Please pitch in $10 or $20 when you see me. Also, Y9 Scrub Club has offered to throw us a Fun(d)raiser in late May. Stay tuned for details. Canine Corner - I've been writing a bit about Joby's Run and posting your dog photos each month for theNoe Valley Rec Center Newsletter. Subscribe to keep up with the latest at the Rec Center. LIKE US ON FACEBOOKto get and share the latest on Joby's Run and local happenings.